1. Core pears from bottom, leaving stems intact. Peel pears; cut 1/4 in. from the bottom of the pear to level it. 2. In a large saucepan, combine the water, sugar, lemon Juice, cinnamon sticks, nutmeg, and cloves. 3. Split vanilla bean and scrape seeds; add bean and seeds to sugar mixture. 4. Bring to a boil until the liquid thickens about 5 minutes. 5. Reduce heat to a slow simmer; place pears in saucepan and poach uncovered for about 35 minutes. Use a tooth pick to puncture the pear, the toothpick should slide in all of the way with light force. 6. When the pear is tender remove and cool on parchment paper. Strain and reserve poaching syrup for later. 7. Thaw puff pastry dough in the refrigerator so that it is pliable but not sticky. 8. Lightly flour the work surface and place the dough down. Cut into 1/2-in.-wide strips. 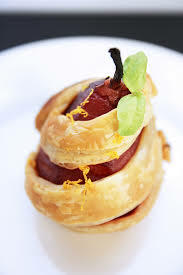 Starting at the bottom of a pear, wrap a pastry strip around pear and slowly go up to the stem. 9. Transfer to a parchment paper-lined Sheet pan. 10. Bake at 400° for 20 minutes or until golden brown (if using a convection oven then cut the time in half). 11. Meanwhile bring reserved poaching liquid to a boil; cook until liquid is thick and syrupy, about 10-15 minutes. Place pears on dessert plates and drizzle with syrup. Serve warm. 1. Place the half of the sugar, half-and-half, and the heavy cream into a medium saucepan, over medium heat. 2. Bring the mixture just to a simmer, stirring occasionally, and remove from the heat. 3. In a bowl mix sugar, yolks and vanilla together. 4. Slowly add 1 cup of the cream mixture to the egg mixture while stirring consistently so that the hot cream doesn’t cook the egg. 5. Next combine all back into the saucepan and heat slowly while consistently stirring the bottom of the pan so that nothing sticks. 6. After the custard has thickened and the zest and juice. 7. Cool completely until the temperature reaches 36 degrees.